Expires July 31st, 2015. Not Valid with any other offer. Price determined by weight of dog. Please weigh dog correctly. An extra fee will be charged at Stinky Dawg if not in the correct weight group. Come wash your furry friend in these state of the art washing stations. And when your’re done washing your dog, you’re done, no mess to clean up! Stinky Dawg is a self-serve dog wash located in San Marcos. 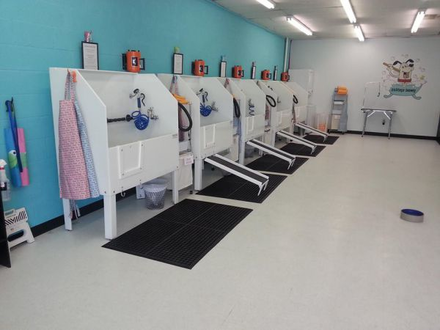 They have 5 state of the art washing stations that include everything you need to wash and dry your dog. The best part is they clean up the mess! They also have gourmet treats, clothing, toys and lots of other fun items to pamper your dogs!